Freeport, Grand Bahama - The Boss at Dolly Madison Home Center has agreed to provide unheard of savings on pro audio gear at Radio Shack. Churches, Clubs, Musicians, Djs, hobbyists, from now through October 31st, get up to 40% off deals at Dolly Madison's Radio Shack Sound Savings Sale. 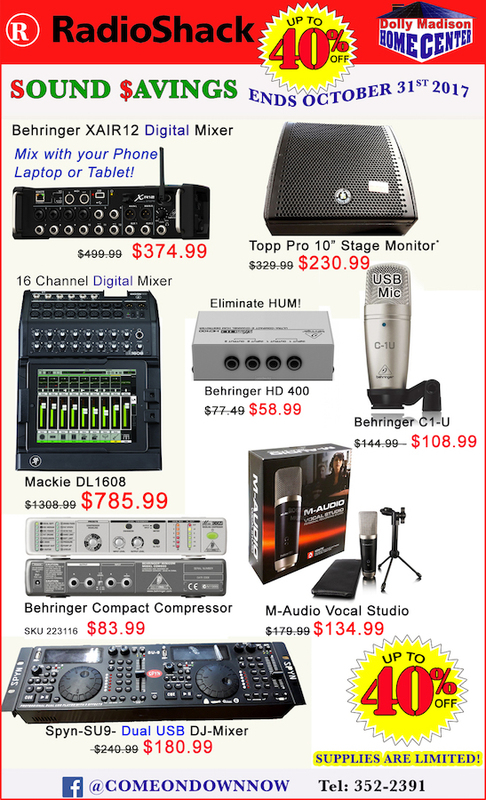 Behringer Digital 12 channel mixer $374.99, USB Condenser Mics $108.99 & $134.99, Topp Pro 10" Stage Monitor, $230.99, 16 channel digital Mackie mixer $758.99, Dual USB thumb drive DJ Mixer (no laptop required) $180.99, all this and more are available in limited supply at Dolly Madison's Radio Shack come on Down Now!